The weather forecast has been accurate so far! Saturday was cold and it rained. Today, Sunday we awoke to the sound of rain hammering against the window = although this seems to have died down we are not anticipating nice weather for the rest of the day, Monday apparently is going to be a nice day! It seems ages since I wrote anything here, due to just being busy I guess, I do try to keep up with my cookery challenge and am pleased to think I am experimenting with new recipes on a weekly basis! However life goes on and I thought it was time I touched base! I am pleased to report all is well in the Nesbitt household, Freida has really settled in well and loves her visits to the beach. The calming influence she has is quite opposite to the stress poor Wilma suffered, but Freida enjoys the simple pleasure of sharing a room with any obliging soul! Indeed as I ramble on here she is sleeping on the settee opposite, occasionally checking me out with one big searching eye! Elsie too seems calmer, although she has her moments of sheer thuggery all in all the household is a calmer place. The hens have truly settled into a routine of delivering lovely fresh eggs on a daily basis and as you can see from the picture even ventured into the house a few weeks ago. This is not to be encouraged as we know what hens do - but they were scratting about by the kitchen patio door hinting they wanted feeding when Elsie trotted in from the garden and poor Eva ran into the house! It is approaching our annual pigrimage to the Isle of Man for the TT Races. We are staying in Port Erin again, but sadly the hotel was booked up for 2011 would you believe, so we are trying Douglas next year to see the events from a different perspective! Anyway that is a whole year away, we have yet to enjoy this years events! We leave on Friday 4th and stay until June 12th. I have a wedding commission to finish and once this is safely put to bed I can begin preparing for our holiday. All animals are booked in at various kennels/catteries/neighbours and the hens and Jo will be looked after by John and Trish from over the road. It is a good arrangement we have with them, as in 5 weeks when they go to Turkey I will be looking after their hens and cats, so it is a case of returning the favour! Thos eof you who listen to Radio 2 may have heard me on popmaster a couple of weeks ago! It was so much fun! The questions were unbelievably difficult and I came away with 6 points! But I was proud! A couple of days later I received a postcard from a couple of listeners I have never met - they said how much they had enjoyed listening to me and that there should be more people like me on the programme! I tell you, fan mail eh? lol! Yesterday I was on BBC ! when I phoned in to ask a question - you can see it here, I am on about 1 hour 10 minutes into the programme! lol! Heat the butter in another saucepan, add the onions, leeks, carrots and cook gently for about 5 mins or until all the vegetables are soft taking care not to burn them. Add the flour to the saucepan and stir thoroughly. Cook, stirring continuously, for 2 minutes. Add the liquor to the vegetables and thoroughly. Continue stirring until the sauce is a thick, creamy consistency. 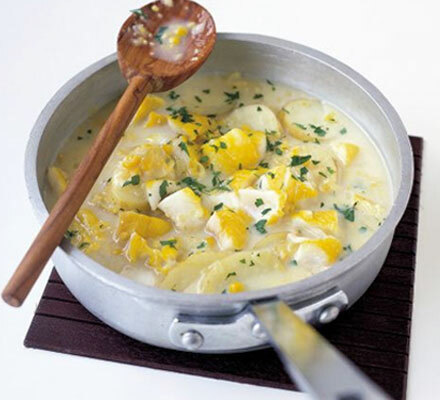 Flake the smoked haddock into meaty chunks taking care to remove any bones you may find. Add the haddock, spinach,and sweet corn to the soup. Simmer gently taking care to not break up the fish too much, bring to a gentle simmer and cook for a further 5 minutes. My cookery challenge continues and this week I am sharing a new vegetarian recipe. 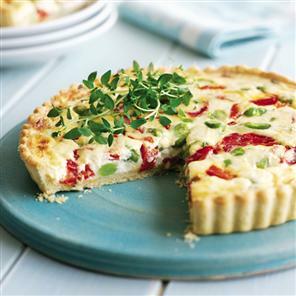 There is a true link to reality with this quiche as on Saturday we are having friends round for supper and one is a vegetarian so this was the reason for my choice! 1. Place the flour in a bowl and add the Lurpak spread. Rub in with your fingertips until the mixture looks like fine breadcrumbs. Add 2 tablespoons cold water and work the mixture into a ball. Wrap in cling film and chill for 30 minutes. 2. On a lightly floured surface, roll out the pastry and use to line a 23cm round x 3cm deep loose-bottomed, fluted tart tin – press into the tin if you find this easier. Prick the base several times with a fork and pop in the freezer for 10 minutes. 3. Meanwhile, preheat the oven to 200°C/fan180°C/gas 6. Line the pastry with baking paper and baking beans and blind-bake for 10 minutes. Remove the paper and beans and bake for a further 5 minutes or until the pastry is dry and pale golden. 4. In a large bowl, beat together the eggs, crème fraîche and Parmesan. Stir in the thyme, broad beans and red peppers and season with plenty of black pepper. Pour into the pastry case and bake for 25-30 minutes or until the filling is just set and pale golden. Cool in the tin for 10 minutes, then put on a serving plate. 5. Garnish with chives, slice and serve with a salad, if you like. Once again I find I have only managed one blog entry this week, this is because life is busy and we are going to the Isle of Man on June 4th for our annual TT visit so lots to do and I have 2 wedding commissions on too! No rest for the wicked! lol! The hens are producing outstanding eggs - my favourite way to cook them is to poach - as seen here! I just drop into a pan of boiling water with salt! Done! 2 - 3 minutes until perfection! 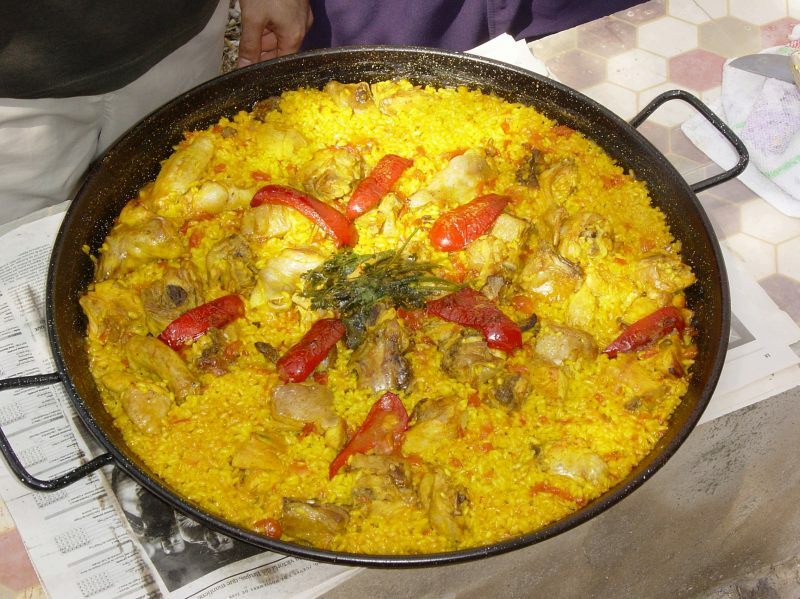 P is for people & Paella! When we have friends round I do not like to be stuck in the kitchen at any part of the evening, I like to be amongst my friends having fun! I tend not to do fiddly food but more of the "Help Yourself" type of dishes. Paella is a great way to use up any fish, sausage or chicken from the fridge. Ingrediants are not cast in stone just a great one to cook in advance and eat with bread! 1.Heat three quarters of the oil in a large frying pan or casserole. 2. Over a low heat cook the onions until they become translucent. Add the garlic. 3. Gradually add the rice and stir around in the onions and oil until the grains are coated with oil. 4. Add seasoning and turmeric to the hot stock and pour on the rice gradually, stirring as the rice is brought to the boil. Cover with a lid or with foil, and simmer gently for 10 minutes. 5. Meanwhile dice the green and red peppers and blanch for 1 minute in boiling water. 6. Poach the white fish in water with a little of the wine and the bay leaf for about 5 minutes. 7. Fry the chicken in another pan in the remaining oil until golden brown and cooked through. 8. Remove the lid from the rice and separate the grains with a fork. Stirring gently, add the peppers, the white fish, prawns, about 150 ml (1/4 pt) fish stock and then add the chicken and stir in sliced spicy sausage. Cover and cook until rice is separate and liquid is absorbed.